Setting up MythTV as a dedicated HTPC machine requires MythTV to start on boot and restart if anything crashes, have no desktop environment and a light weight display manager. I found the best display manager for running MythTV as a dedicated HTPC is LightDM. It is easy to configure, has no default desktop environment, and has auto login feature. Once configured correctly only mythfrontend will boot on startup and respawn is anything crashes. To switch to LightDM, first make sure it is installed. Greeters provide the login panel, so remove any reference to greeters. The autologin-user is the user you want mythtvTV to run as. user-session is the xsession to run after logging in. The value of user-session needs to reference a file in /usr/share/xsessions/. So in this example my user-session is mythtv so I need a file named mythtv.desktop. If everything works when lightDM restart it should automatically login mythtv user and running mythfrontend. If something so wrong check out /var/log/lightdm/lightdm.log. Posted by John on December 4, 2018 at 4:04 pm under Uncategorized. My biggest gripe with the Android head units is the user experience. There are a handful of Android launchers available on the Play Store that provide a more automotive experience. I tried a few and could not find the right balance between Android and an automotive experience. So I spent the last few evening creating one. Install and go! I don’t think new users should have to invest time setting up and configuring the launcher. The defaults settings should provide a complete experience. Settings should be available to tweak the experience once you’re familiar with it. An Android experience within an automotive environment. A balance of automotive UI experience with Android paradigms. A lot of the available automotive launchers provide a unique experience, completely dropping any Android paradigms. Larger touch points so interacting with the UI is easy. Having precise touch points requires to much focus. Something I learned years ago swapping an OEM head unit with an Alpine. The memory buttons where so small on the Alpine, that hitting the right one required focus. The seven apps on the bottom are all configurable with a long press. 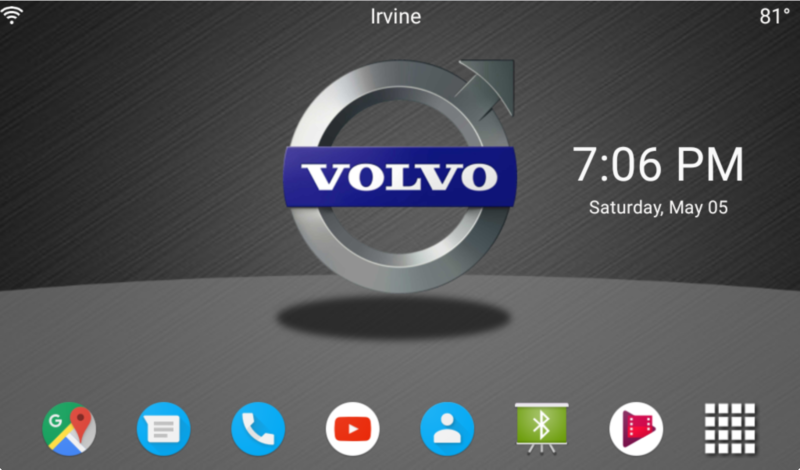 Phone message integration, similar to Android Auto. When a message is received a notification displaying the message is displayed on the screen. Wallpaper support to provide even more of a personal experience. The launcher is stable but far from feature complete. I’m interested to hear what others think would add usefully functionality to the launcher, while still adhering to the goals of the launcher. If you would like to install it directly on your head unit, goto Chrome and type in the following url to download it directly on your head unit. If this is your first app not from the Google Play Store then it will prompt you to change a security setting to allow apps from “Unknown Sources”. After changing the setting click on the downloaded apk and it will install. Posted by admin on May 5, 2018 at 1:31 pm under Uncategorized.